Sometimes life throws a few curveballs our way, and we just need to roll with the punches. Designed with variegated and other hand-dyed yarns in mind, the Roll With It socks give you little bit of pattern to knit as you roll through challenging times. With patterned and plain rounds in each repeat, these socks will work up quickly and be fun to knit. Worked from the toe-up, featuring the perfect fit of the the Fish Lips Kiss heel, by the time this challenging time has passed, you’ll have a pair of Roll With It socks to enjoy. The Roll With It socks feature the Fish Lips Kiss Heel. This pattern is available as a separate Ravelry Download for $1. The pattern contains details on how long to make the foot of your sock, how to turn the sock heel to get a great fit, and has links to video tutorials that will make the short rows in the heel go off without a hitch on the first try. 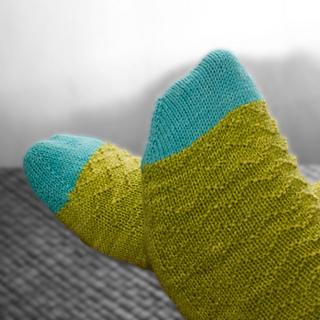 If you don’t already own this pattern, it is necessary to purchase it or choose a different heel type to complete your socks. I understand that this is unorthodox and makes this pattern feel incomplete, but I feel that this heel pattern is so worth the additional $1 that you’ll spend, I have used it exclusively. If you purchase and try the pattern and decide it wasn’t worth your money or effort, please contact me and I will refund your $1 myself. This pattern can be worked with any of the standard needle types for making socks, including double pointed needles, magic loop, two circular needles, and two at a time. 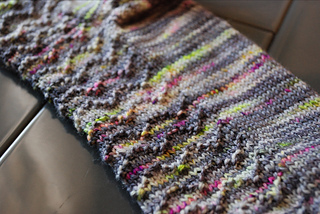 For the foot of the socks, the stitch pattern is worked on the instep (top of foot) stitches. After working the heel, the stitch pattern is worked over all stitches until the leg length is approximately 2 inches /5 cm shorter than the desired length. I would consider this pattern to be at an Intermediate skill level; The stitch pattern is simple, but the project requires knitting in the round, working simple stitch pattern from chart or written instructions, and several shaping techniques including increases and short rows.